Retailers of all sizes must embrace mobile technology’s role in the in-store shopping experience by providing the content that consumers want, when they want it, in easy-to-use formats. Most of today’s consumers never leave home without their mobile devices—they are now an integral part of daily life and have increasingly become shopping pals. A research report from Maxymiser entitled "Mobilizing the Retail Shopping Experience" reveals that mobile devices are playing a growing role in consumers’ trips to brick-and-mortar stores. According to Maxymiser's research, 39% of mobile device owners are currently using their devices in store aisles. Although many of us have heard tales about the demise of brick-and-mortar establishments, the National Retail Federation reports that retail sales were over $2.5 trillion in 2012. 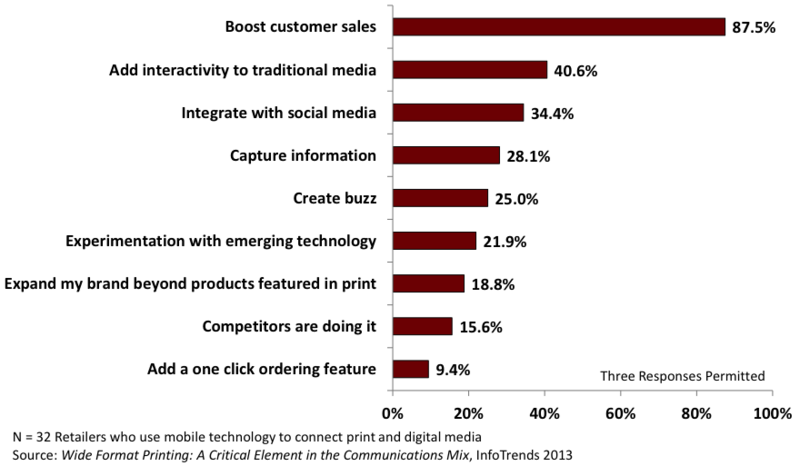 Of these, only $226 billion (9%) were attributable to online sales. Capturing the customer’s attention with unique and different in-store experiences is critical. In many instances, accomplishing this task means blending signage with mobile technology. 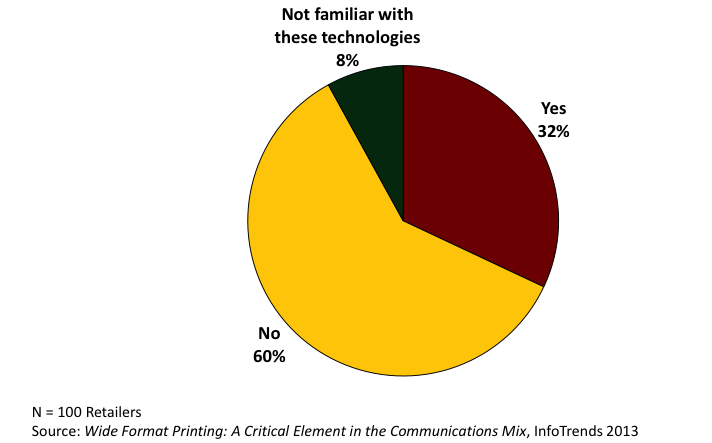 InfoTrends’ 2013 Study entitled Wide Format Printing: A Critical Element in the Communications Mix found that 32% of retailers are adding interactive components to signage. 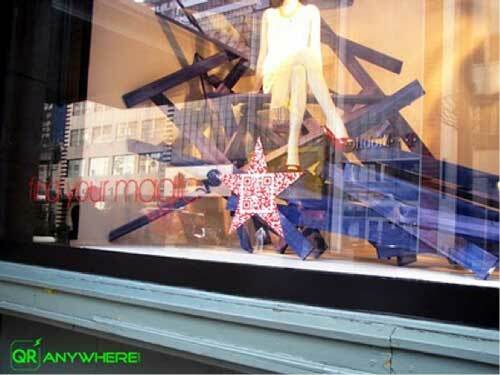 The objective is to drive customers into stores and increase sales in brick-and-mortar locations. Figure 1: Have you ever used mobile technologies to combine wide format print products with digital media channels? Among respondents who were using mobile technology to connect print and digital media, the most common objectives were to increase sales, add interactivity, and integrate with social media. Figure 2: What are your company’s top reasons for blending printed wide format products and digital channels? Today’s retailers have a variety of options for blending QR codes, SMS text messaging, and NFC tags with signage to drive business and customer loyalty. This concept transforms the idea of “window shopping” by providing retail consumers with access to product information, videos, and reviews. Even if a store is closed, prospective shoppers can use mobile codes from window displays to access product/brand information and potentially link to a site to order merchandise. During business hours, retailers can offer special discounts to entice the shopper to enter the store. Macy’s has leveraged QR codes with its backstage pass to provide shoppers with essential tips and the latest trends from various style icons. Shoppers can scan QR codes or send texts to view videos from celebrity designers and fashion experts. Mobile codes can be embedded in signage to encourage customers to purchase products by relaying valuable information, alerting them to upcoming sales/promotions, and offering them an interactive view of new products on the way. 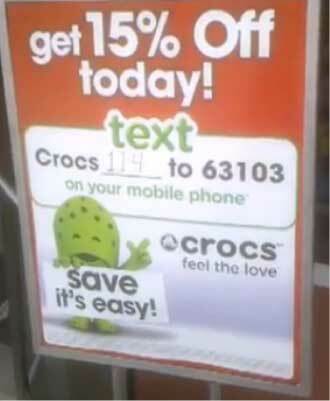 Crocs used simple signage with an SMS text opt-in to encourage purchases using a 15% off coupon. Retailers can utilize signage combined with mobile codes to capture information and convince prospective purchasers to opt-in to a mobile relationship. For example, retailers can include a simple sign-up feature on the QR destination page to encourage visitors to enter their e-mail address or cell phone number for special deals. 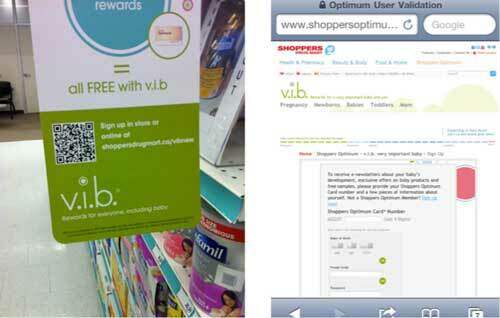 Drugstores are using mobile codes to encourage customers to join customer loyalty programs. The link to the mobile microsite gathers appropriate customer information. Despite speculations about the demise of traditional retail establishments, today’s consumers continue to flock to malls and shopping areas. Savvy retailers are working to engage consumers so they ultimately spend more time and money in retail environments. Signage is a driver for purchases as well as engagement, and it can help retailers capture the opportunities in today’s market!